On Saturday, the Varsity Boys Volleyball team traveled to IS Basel for the 2018 SGIS Championships. The tournament featured seven teams from Switzerland and southern Germany, with two groups of pool play followed by a playoff bracket. Based on the previous year’s performance, the Tigers were placed as the third seed in Group 1, facing defending champions IS Basel in the first match of the day. Despite traveling the furthest, not playing in a game for three weeks, and missing a week of practice for Academic Travel, the boys were fired up and ready to perform in their first major tournament of the season. Having lost a close match to Basel in their first game of the season, the Tigers knew they would have to play at their best to have a chance to beat the tournament hosts. Unfortunately, the first set got off to a bad start as TASIS struggled with passes and gave Basel a huge 11-3 lead. However, the Tigers eventually found their rhythm, and strong spiking and serving from Nadir Timerbaev '19 and Ivan Linnikov '22 helped them fight their way back. A great combined save from Zhantemir Sarsenov '21 and Max Minkov '21 late in the set gave the Tigers a boost of confidence and helped the team tie up the score at 20-20. From there, the Tigers seized the momentum to take the first set and grab a surprising 1-0 lead. The second set was another fierce offensive battle, with strong spikes and blocks from both teams. Despite a number of spectacular digs and spikes from Timerbeav, Linnikov and Josh Galmarini '20, Basel squeezed out a close win to tie up the match 1-1. The third set was equally intense, with both teams playing well on offense and defense. A tight, back-and-forth battle followed with neither team able to break away with a lead. A side out and quick point allowed the Tigers to come from behind once again and take the set 15-14. After the intense three-set match against Basel, the Tigers had a difficult time keeping their energy up for their next match against Lausanne. The Tigers quickly fell behind in the first set due to serving and passing errors. A late charge led by a serving run from Ivan Kozhuhar '21 gave TASIS some hope, but the effort was too little too late: Lausanne managed to break the serve and close out the set with a 25-23 win. In the second set, TASIS looked a little more energetic but still could not manage to hold the serve and make a run. Lausanne responded to the tempo of the match with even stronger offense and solid serve-receive. A string of bad passes and missed serves from TASIS gave Lausanne an insurmountable lead, and the Tigers had their seven-game winning streak snapped by a decisive 0-2 loss. Realizing that their championship hopes hung in the balance, TASIS returned with a renewed focus in the third pool-play match against Kumon. Assistant captain Galmarini led the offense with near-perfect setting, allowing Timerbaev, Linnikov, and Kozhuhar to rack up kills against the notably strong defense of the Kumon squad. TASIS bolstered its offense with strong passing as well and cruised to a 2-0 victory to lock in the top seed in the elimination bracket. 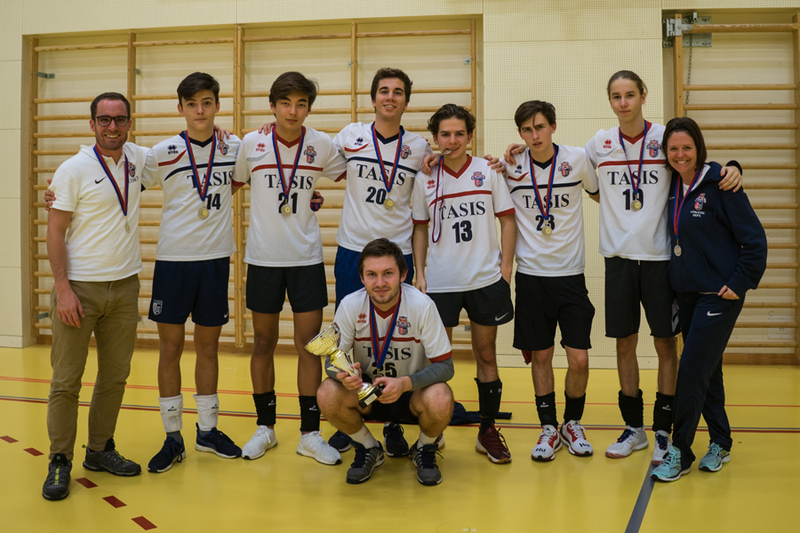 For the semifinal match, TASIS played against a familiar opponent in ISZL, who placed second in their pool-play group. Having lost to the Eagles earlier in the season, the Tigers knew they would have to play well to win and advance to the finals. Luckily, the boys brought the momentum from their previous game against Kumon and displayed a well-balanced offense and defense. Given the strong blocking from ISZL, the Tigers placed the ball well and found the holes in their opponent’s defense. Timerbaev (6 kills) and Linnikov (4 kills) dominated the net, and Galmarini put together a great serving run with three aces. TASIS avenged its previous loss with a 2-0 victory to advance to the championship. TASIS would face-off against BFA, who upset the hosts, Basel, 2-1 in the other semifinal match. Although TASIS had beaten BFA earlier in the season 2-0 at home, they knew it wouldn’t be an easy game against the Falcons, who had a large crowd of their own this time around. In the first set, the Tigers looked like the clear favorite. Showing their offensive might, Timerbaev, Linnikov, and Kozhuhar dominated the net and racked up kills against a disciplined BFA defense, winning the set and taking a 1-0 lead. It looked like the Tigers were poised to repeat their earlier 2-0 victory in the second, but BFA refused to give up. Despite continued attacks from Timerbaev, Linnikov, and Galmarini, BFA kept digging the TASIS spikes and wouldn’t let the ball hit the floor. After a grueling back and forth second set, the Falcons evened up the match by squeaking out a 25-23 win in the second set to tie the match at 1-1. The third set continued with TASIS pounding the ball on offense and BFA scrambling on defense. With all the teams and fans at the tournament now watching, the match played out in dramatic fashion with long points and amazing saves on both sides. After coming back from 13-10 to tie up the match at 13, a side-out and one more long point allowed BFA to take the third set 15-13. Despite pouring all their energy into the 75-minute match and out-scoring BFA in points overall, the Tigers had to settle for 2nd place with a disappointing 2-1 loss. With some well-deserved rest and renewed determination, the Varsity Boys Volleyball team looks forward to its next tournament at the European Sports Conference (ESC) Championships next weekend at ISZL.